Have you ever wondered whether there is any magical formula for generating more business? A simple process you can follow consistently that just gets results. It sounds simple doesn’t it … and is simple in principle. The more familiar you become with this 4 step process, the more opportunities you will discover that you can apply it to. It is imperative that you get completion on each step before moving to the next. Just like a Baseball player – he can’t get to base 2 until he gets to base 1 first. A man rings you up. You have never spoken to him before and he immediately jumps into asking you if are happy with your current home loan. What is your response within your mind? It could be something “I don’t now who this person is and he has jumped straight into probing me on my financial needs”. In this case he has bypassed step 1 (build trust and rapport) and straight on to step 2 (discover needs). An even worse situation than this is if he had bypassed both bases 1 and 2 and started his conversation with “Hi … would you like to take advantage of our great home loan offer”. Here again, little or no trust and rapport building is present and he has gone straight to flogging his product! He has no idea about your what your needs are and yet is happy to tell you all about what he can do for you. It’s important to realize that you must feel a sense of trust and rapport between yourself and the client before you start discovering their needs. Otherwise, they may be reluctant to open up and share with you the challenge they need support with. You must understand their needs before you can offer them a solution, otherwise you are “mind-reading” – this becomes a gamble. Only then, when you have created the desire by offering an appropriate solution can you expect them to consider taking action or saying “yes, I would like to proceed”. 2. Ringing the client to organize a face to face meeting (short term focus). 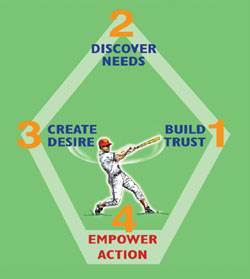 What other situations can you think of where you can apply the 4 step client relationship building process?